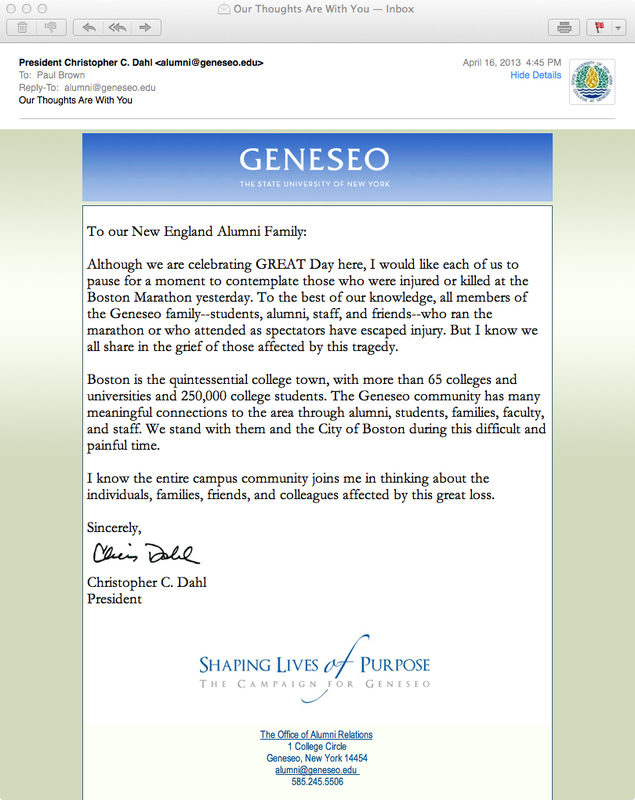 From my faculty advisor the day after the Boston Marathon tragedy. During the Boston Marathon tragedy, I happened to be in Texas visiting friends, but my thoughts immediately returned to my students. Although I am now on the “academic side” of the house as a teaching fellow and adjunct faculty member, I remember being a practioner during a number of crises. During 9/11, I was a Master’s student in the College Student Personnel program working in the Office of Student Activities at Western Illinois University, a very similar position to where many of my students now found themselves. The morning of 9/11, we had class at 9:30 am. 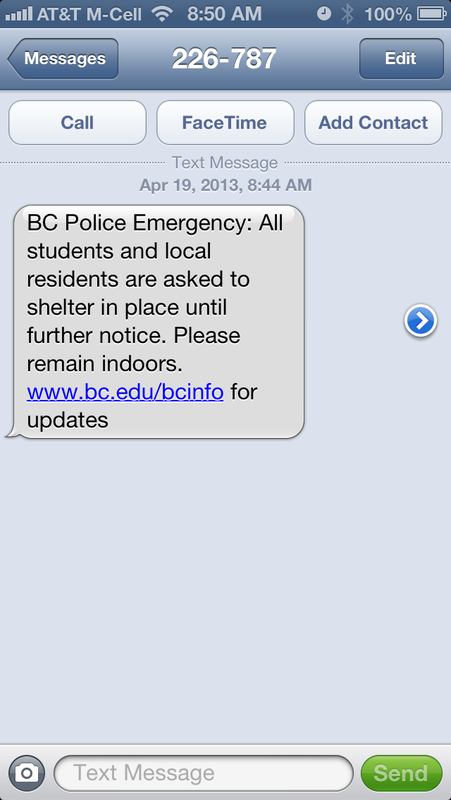 I remember walking down the hallway of Horrabin Hall, heading to class. There were TV monitors in the hallway and people were stopping to look at the news. That is when I found out about the planes hitting one of the twin towers. I paused, watching what was unfolding on the screen, still not quite sure what was going on, but knowing that it was somehow something big. By the time I reached class, we had begun to know more. I was a teaching assistant for Bob Reason at the time, and it was clear that we all didn’t know what to do. We started talking about what we knew about the events and people expressed fear and a desire to reach out to their loved ones. After about 10 minutes in, recognizing that no teaching or classroom learning could be done that day, and that the campus needed its staff, Bob decided to cancel class. Not knowing where to go, we all went to our respective offices. These were, after all, our second homes and communities. 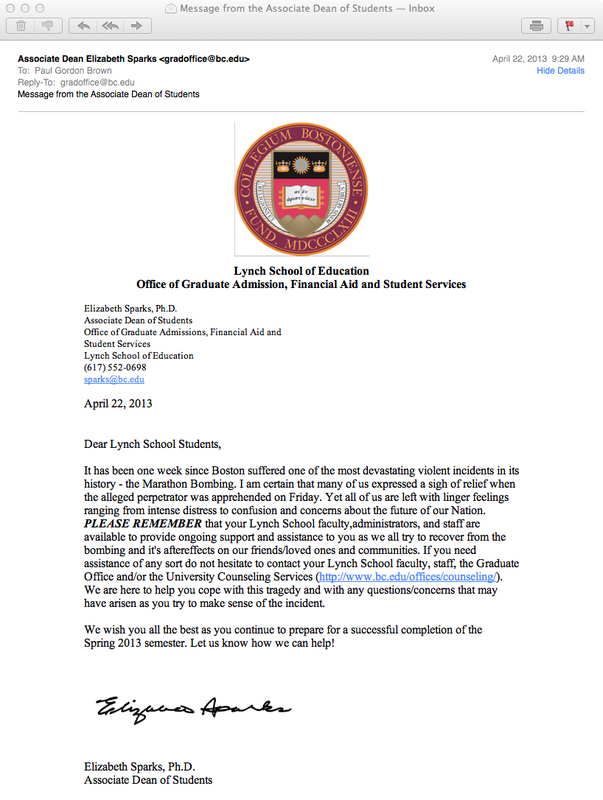 I went back to the Office of Student Activities and learned that the Vice President for Students Services, W. Garry Johnson, had called a meeting for later that morning. The meeting was for the Directors of all of the departments, but as graduate students we were allowed in to participate. Looking back now, I recognize that this was done because our supervisors recognized this was a learning opportunity for us. A unique opportunity and a unique situation where we were not just graduate students, but full-fledged members of the professional staff. In times of crisis, we have unique roles, and there is a chain of command, but also, in an odd way, we are all equal. I went back to our office and we began preparations for the vigil that night. Posters. Advertising. Securing space. Being in student activities, we were not on the front lines like our friends in counseling or the residence halls, but it felt good to do something… to feel useful in some way. Looking back now, I recognize that it allowed me set aside my rush of emotions and feelings that were still too raw and confusing to process. It was both hard and easy to set them aside when I felt I had a purpose and a task. I wasn’t able to begin to work through and process some of my thoughts until the late afternoon. 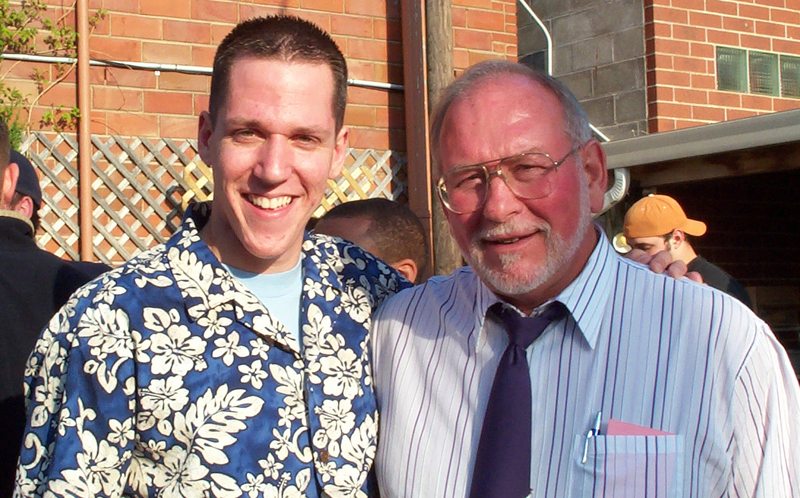 I remember sitting on the couch of my friend and fellow graduate assistant, Nathan Hanke. I’m from New York, the state, not the city, but I still felt a weird connection to the events. I watched the news as they endlessly repeated the same information over and over again and just felt numb. I decided not to attend the vigil that night. Although that type of group collective action is helpful for some, for me it was better just to be surrounded by a few close friends. I remember that our Director at the time, Dan Maxwell, had the grace to let us do what we needed to do. Others would be there to staff the event. Those that were stronger, or just in the right mindset to handle it, would make sure what needed to get done, got done. Looking back now and having been through a few more crises since then, both big and small, I’ve taken away what it means to be a helper. You not only help those with whom you are charged to protect, but you help each other. You help the helpers. Your priority is to take care of your students, but as time and the situation allows, you step in to allow others to step back, and they do the same for you. You do this without even needing to talk about it because you all just know. I find comfort in this. The unspoken bond of a group of individuals who know what they need to do, but also know when to give each other the space and grace to handle their own feelings in their own ways. When you’re at dinner with a colleague and the duty phone rings, you don’t need to explain your situation or apologize, you just leave and handle the crisis. When you’re in the heat of the moment and you get angry or curt, you don’t need to apologize, you know that others understand you’re dealing with the situation as best you can. It’s that unspoken kinship, that connectedness, which gives me strength in the face of difficult situations. Paul Brown was a Teaching Fellow in the Boston College Higher Education program at the time of the Boston Marathon tragedy. 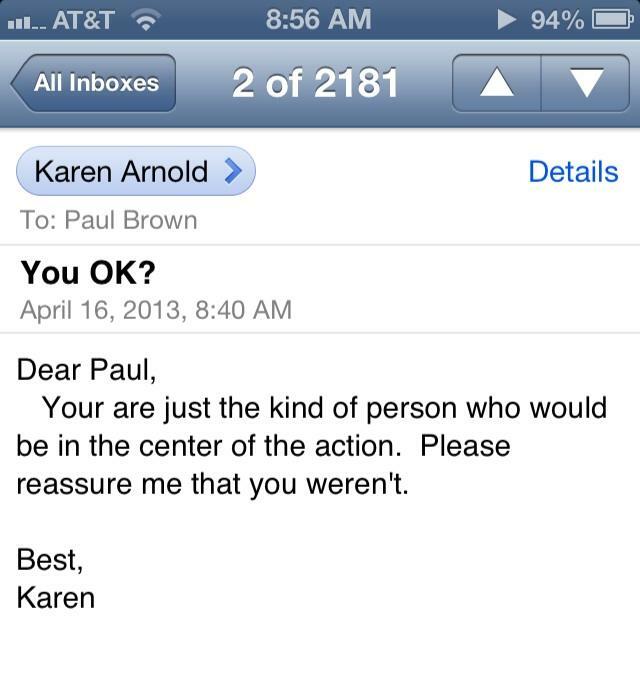 You can reach out to Paul directly via tweet or email. Please feel free to share this on your social network of choice using the link icons below. We also welcome you to share your reactions and stories in the comments section below so we may all benefit from your thoughts and wisdom.